Occupy Middle School and ISB EAL are proudly working towards a professional collaboration with the Center for Applied Linguistics and Jose Medina. The Gr8 EAL classroom engages students within an interconnected framework of Sustainable Development Goals, MYP Global Contexts, SIOP framed content and language objectives, and WIDA literacy rubrics. Our OMS/ISB EAL/CAL collaborative goal is rooted in empowering diverse student populations via global citizenship, multilingualism, multiculturalism, authentic literacy, and real-world projects and publications. From a more unit-based perspective, students embark on authentic publication and inquiry-based work, collaborating to create technology-based outputs and project ideas designed to generate solutions related to global and local issues. All student inquiry and lesson preparation links to ELA literacy standards, WIDA rubrics, 21st century learning goals, and sheltered instruction (SIOP) EAL practices. Students are provided with clear objectives each day both at the start of class and the end of class (also referred to during workshops when necessary) to build intentionality into their literacy development and connections to SDG goals and Global Contexts of their learning and action. Students are able to take more personal stock in their learning and reflection when they see clear objectives to develop and identify as they conference or share learning to others. Occupy Middle School (OMS) EAL and curricular objectives are linked to a crucial cycle: Care, Aware, Able, Act. In the diagram above, OMS works with Seoul Foreign School Gr8 to collaborate on a lasting citizenship, PBL curricular and cultural shift. Setting bi-monthly or monthly inquiry questions give students a sense of urgency in an ever changing and eventful world. CNN10 is one media platform that offers accessible news for EAL students and links well to literacy and citizenship standards. The newscasts help develop vocabulary, global awareness, media literacy, and listening skills, an often underdeveloped academic skill in EAL students. Most importantly, it offers a means for developing questions and curiosity about a challenging world. (Above) Judy, a recent EAL arrival, embraced her role as a town hall facilitator for the campus radio station and has since become president of the HS Chapter of Futures Public Radio. As students identify inquiry questions, feature topics, or interviews to pursue, they are asked to think intentionally about all aspects of an eventual feature. Engagement with higher-level, challenging reading is scaffolded by access to an engaging visiting expert and the enthusiasm for being asked to research as an early stage in leading a live interview as a part of a news team. Quality questions begin to flow as rich, authentic, and publishable opportunities await. Students learn how to interview different types of subjects (youthradio.org DIY interview toolkit), while building a well-rounded and comfortable interview via a potential hierarchy of opening, filtering, factual, probing, and hypothetical questions. EAL investigative journalism team set for the Phil Kassouf interview to be published on FPR in late September 2017. 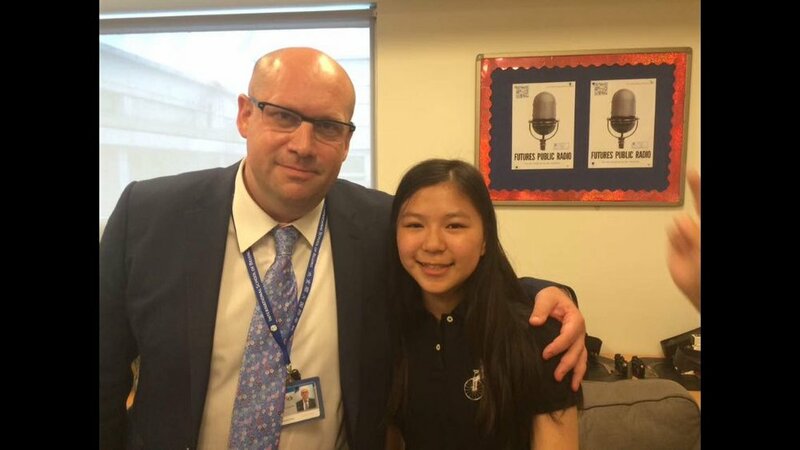 The team of interviewers were all EAL intermediate students that will now attend the Global Issues Network Conference in Shanghai as part of the collaborative media team with the Concordia International School HS Student Media Services. Two hours into the FPR workshop, after a long Monday at school with the Phil Kassouf interview, students remain thoroughly engaged in the FPR journalism workshop. Nearly half of the student staff is made up of EAL students. Ellie and Alicia develop their media literacy in the highly difficult storytelling skill of editing. Below: The final interview is successfully published and shared on the Futures Public Radio website. 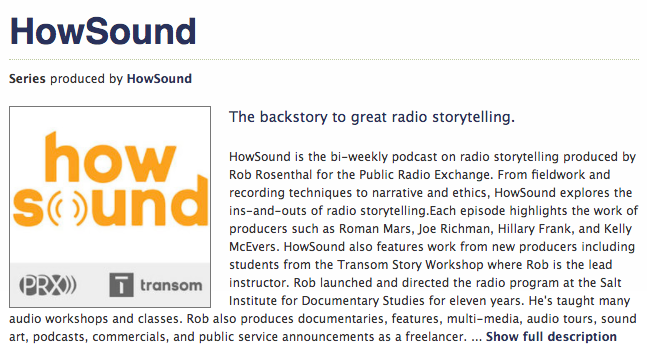 The HowSound podcast is an invaluable learning and listening tool for EAL students and all FPR journalists. Once a reluctant writer, Lyndon has found his voice and academic and technology leadership skills blossom in FPR. The Last Book in the Universe is an excellent Lexile friendly chapter book with mature themes which tackle huge amounts of social issues ranging from addiction, to genetic engineering, to poverty, to urbanization, to governance. Without a graphic novel or screenplay, students are thrilled to embark upon a collaborative writing opportunity. A Long Walk to Water is another such book I have used that carries equal possibilities. One piece of the screenwriting workshop linked to reading comprehension is the collection of non-negotiable quotes that "must end up in the script". Pens to Lens is a solid resource for MS/HS students to see the nuances in formatting and writing screenplays. Themes from Last Book in the Universe link well to the global-issues-based literacy work found in the Facing the Future chapter "Envisioning Our Future". Content and language objectives (expressive reading for comprehension) pull the kids into their language development as they are excited to create and submit an authentic screenplay to an editor in Los Angeles. Remaining focused on a community goal and a real-life, published piece engage and empower learning. Capturing pre-assessment data on what kids know about screenplays will be one focus of this mini-checkpoint. A first step in screenwriting is identifying critical plot points that are non-negotiable events for the eventual script. Authentic publishing and real world writing truly enhances the engagement, highlighted by over 90% involvement in the activity in all mini-groups. Following the determination of the plot events, students map the level of intensity and action, followed by the emotional wellbeing of each of the main characters in response to the events. This helps students identify tone, a key element in screenplays for both verbal and non-verbal language. Below: Students complete linking the plot, characterization, setting, and theme in a visual planner that will act as a backbone to the nuances and interconnectedness of the elements of fiction in the screenplay, hitting major standards in the process. Students key word plot events and then create a line graph of the rising action in this cliffhanger. Following this, character wellbeing is mapped, and finally, key settings and themes are posted to create this creative, interconnected storyboard. William, often a reluctant writer, shines in his second draft of Chapter 20 of Last Book in the Universe. The workshop model and the authentic output engages him at a high level. "The effect human beings have on the landscape around them is the theme of Baker's most recent tour de force....The artist's multimedia collage constructions are, as ever, fascinating in their realistic detail and powerfully convey the dramatic message.."--Horn Book. Students co-write and then narrate the picture book, creating an audio/video version of their thematic and expressive interpretation to be shared with the ISB Elementary School. The quality and intentionality of expressive reading grows by leaps and bounds when authentic and meaningful publishing is attached to projects. Each student, all of various EAL levels, use the writers' workshop to individually develop pages, conference with the teacher, peer edit, and then produce a publishable audio file to accompany the picture book. In the video below, Grade 8 students Karen, Austin, Caterina, and So Yeon share tips and experiences on how to write and record a narrative for a picture book without text. In this case, the book Window focuses on important themes related to sustainability and development of cities, themes which drove the creative process and narrative elements. 4MW hopes to follow a similar PBL experience later in the school year. In this final reading of the project, students feel expressive and proud but also recognize things they would change in the next multimedia piece. Grade eight students Soyeon, Karen, Caterina, and Austin crafted the narrative for the picture only book Window. Window examines the influential role of development on our natural surroundings by following one child through his first twenty-four years of life. The writing team collaborated by creating drafts that were then vetted by the entire group. Using multimedia and FPR as a publishing platform allows the grade eight team to share their work with the entire elementary school and global community more easily." "While there are many opportunities left for literacy growth and media literacy development, this project highlights the interconnectedness of global citizenship, literacy, community media publication, and growth mindset. 5. What's Going on in this picture? (Above) Judy highlights her understanding of figurative language and author's craft through the study of her favorite song. Songs and songwriting are a powerful entry point to literacy and analysis for any student. does art have the power to change the world? Starting with Exit Through the Gift Shop, students delve into basic questions like "What is art? ", with the eventual examination of art and its role in society. Messages from political artists and satirists like Banksy are studied. Students then develop some of their own thematic street art around the school, embedded creatively into school walls like the great street artists do. Artists will share their vision via either QR codes within the art and/or and actual walking tour of the art with the artists. The political and satirical art of Pawel Kuczynski works as a great entry points to global issues, governance, and media. Occupy Middle School has utilized the painting above to help EAL students begin a deep inquiry into income inequality. "How Can Art Change the World?" inquiry transfers nicely into numerous art forms such as music, modern art, film, theater, and dance. Thank you to LeeAnne Lavender of Concordia International School Shanghai for the collaboration on this exciting project. When researching information to create a narrative and take on the perspective of another human being, especially one living in challenging circumstances, guiding students towards finding reliable feature stories and sources is non-negotiable. Plotting a truthful and rich storyline from there is much easier and grounded in actual facts and experiences, making the narrative more powerful and affective for both the writer and the audience. After researching and identifying a particularly compelling story, students built their narrative poems around a process of determining theme, other important elements of fiction, retelling and paraphrasing, and finally thinking poetically and intentionally. In the videos above, the empathy and passion in the student story pitch and narrative poem performance are powerful reminders of the high level of student desire to make a difference in their complicated worlds. Capturing the process and the standards in reading and research, writing, and speaking becomes a joy to observe and collect. FPR and EAL students collaborate to manage the live broadcasting booth in the cafeteria. Responsibilities include: Monthly program planning, service club integration and PSAs, live deejaying including mini-stories that establish thematic music shows (ex: great women of music), leading live interviews, and being an essential community voice in a public setting. Chinese teachers also take part in the broadcasting and deejaying, demystifying the fears related to speaking in public as a second language learner. The project began with a viewing of Fed Up and episodes of Jamie Oliver in order to examine the state of food on the ISB campus. Later, students researched the Slow Food movement in order to develop ideas for local action. They finally advocated for collaborated and action-planned with members of the campus food services and Element Fresh to rewrite the campus menu and change the food culture of the campus. FPR/EAL host the inaugural Global Issues Media Network and journalism conference: May 2017!! !